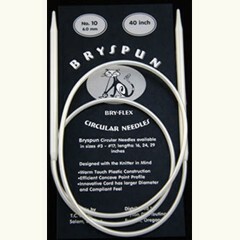 Bryspun flexible knitting needles are made of a special plastic and are great for those with arthritis. These needles are light weight, flexible, and very warm and soothing to the hand. Bryspun Needles are also known for their fine and defined points. *Pictured above is an Bryspun Circular Needle in a random size and length.